Blur Busters Forums • View topic - FreeSync worked on CRT too -- tested by a few! FreeSync worked on CRT too -- tested by a few! After the previous discussion a while back, I'm wondreing if anyone has hacked FreeSync onto a CRT before, just for kicks? It'd be fascinating from a hacker perspective, just to test variable refresh rate on an existing multisync CRT. RealNC wrote: Trick question: what would a variable refresh rate CRT look like? Like the vector displays. They were variable-refresh-rate displays that had a lower refresh rate when there were more lines on the screen. Gradually flickered more and less in a modulating fashion. The Star Wars vector arcade game (1983) was a variable refresh rate CRT. A variable-refresh-rate raster CRT display would be kinda like that. The raster CRT display could be simply geometrically thought like a vector display that simply painted a bunch of stacked horizontal lines (while modulating mid-line to create the shades) -- same thing. But the count of lines does not change between refresh cycles, so you would need to lengthen/shorten the time between the refresh cycles. Ideally, you want the CRT to scan at its maximum speed (e.g. 120Hz refresh cycle, regardless of pause between refresh cycles). And use the pause between refresh cycles (variable VHOLD sizes, possibly) to vary the refresh rate. And to slightly reduce the flicker problem, you could set the electron gun brightness as a function of the amount of time passed between refresh cycles (nonlinear will be needed due to electron gun behaviors...) It probably would behave as an okay variable refresh rate display as long as framerates modulated slowly rather than suddenly. 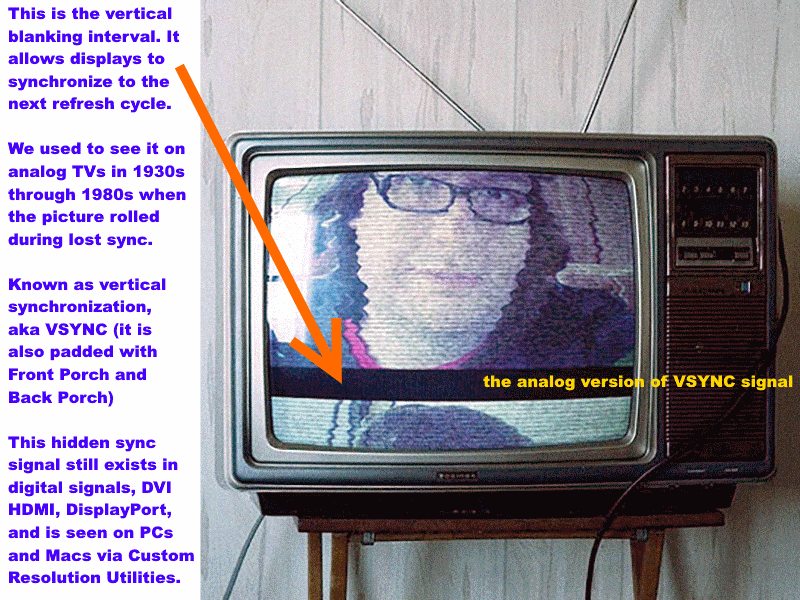 You'll need a CRT with really strong sync capability. They might already exist, but no experimenting has been done to find out. Some of them actually could tolerate minor random changes to VHOLD size without noticeable flutter (picture size changes at different refresh rates, etc) -- but I don't think many experiments have been done with true variable refresh rates via raster scanning on CRT. (Just by vector scanning, as refresh rate is a function of the number of vectors, as vectors take time to draw). Some would have no range (goes blank for a moment), others a narrow range (e.g. 0.5Hz) and others might have a shockingly wide range (full spec range) and work with a GSYNC/FreeSync output with an adaptor (which might need a hacked LCD monitor in between the computer and the CRT display). I'd imagine FreeSync would be easier to "adaptor" to a CRT for testing, given it's able to be tweaked to work over DVI, and FreeSync already kinda uses a sort of a variable blanking interval -- exactly the sort of thing we need. I think it's easier to force FreeSync output to a non-FreeSync display. And there's DVI to VGA adaptors already. Hacker experiment? Almost twenty years ago, I remember the days of PowerStrip and I remember being surprised some of my CRT's could accomodate a sudden 0.5Hz refresh rate change without much of a flinch (especially if the refresh rate changed occured during VBLANK / VSYNC / VHOLD). Most CRT blanked out for a moment, but some didn't. I wish I knew which CRT's were "strong" at refresh rate changes. Ideally, you want to keep horizontal scan rate fixed & unmodified at a very high rate (the horizontal scan rate of the maximum desired full display refresh rate) and simply vary the number of blank lines in the synchronization interval (i.e. vary the thickness of the VHOLD bar, that black bar you see in a rolling analog TV...) in order to vary the vertical refresh rate. Some CRTs were able to tolerate a minor variance; I wonder if there happens to be some old CRTs with ranges wide enough for FreeSync-adaptor experiments without blankouts or too many picture distortions. Also, modifying the CRT to suppress it auto-blanking behavior, may be useful -- since we'd be doing much more dramatic refresh rate changes. That could be quite difficult, unless reverse-engineering the microcontroller software built into the CRT, especially if it uses electronics means of handling that. Then again, that's probably not an issue for older CRTs that displayed visual disruption during refresh rate changes. Either way, disruption can be reduced or eliminated on a CRT, by well-timed sync changes, i.e. gracefully timed exactly during the blanking interval. CRT with strong multisync support, that can suppress blanking during sync changes, would be good candidates for testing FreeSync on a CRT, with hardware hacking. FreeSync test worked on CRT too! Actually, FreeSync works on a CRT! Users have successfully run FreeSync on CRT, by user OnnA on Guru3D. A specific version of ToastyX can force FreeSync on non-VRR connections, with a HDMI-to-VGA adaptor. Re: FreeSync test worked on CRT too! Several multisync CRTs were discovered to work perfectly fine with FreeSync (in specific tweaked ranges). Multisync are generally flexible enough to slew refresh-rate realtime. Not surprising, since vector CRTs could do this. The problem is many CRTs are designed to blank-out during refresh rate changes -- and memorize picture settings for specific refresh rates -- so older CRTs work better with FreeSync than newer CRTs. Basically the older "dumb type" multisync CRTs that disrupted funny (doesn't blank) during refresh rate changes; those are the ones that works well with FreeSync! Flicker changes will definitely be an artifact however. The flickerate changes will feel similar to what you saw on the 1982 Star Wars vector arcade machine -- especially when you watched the Death Star explode after your mission (holy flicker, batman!) -- you noticed how the flickering modulated the more/fewer vectors were drawn on the screen. The modulating-flicker effect of FreeSync on CRTs is exactly like that. It is more noticeable and bothersome during sudden framerate changes/slowdowns, but is not bothersome at all during gradual changes of framerates. Sometimes your range will be tight (e.g. 60-75) but you may get huge ranges such as 56-120 on some multisync CRTs like one person did. I'd love you to test FreeSync on your old Sony GDM-W900. Just needs ToastyX CRU to force FreeSync on VGA (via HDMI-to-VGA adaptor). Chief Blur Buster wrote: I'd love you to test FreeSync on your old Sony GDM-W900. Just needs ToastyX CRU to force FreeSync on VGA (via HDMI-to-VGA adaptor). But yes, will look into this when I get a chance. Re: FreeSync worked on CRT too -- tested by a few! I hope so! Isn't FD-W900 newer than GDM-W900? Hopefully FD-W900 doesn't blank out during VRR changes. The blank-out is an additional electronics addition to CRTs intended to prevent users seeing from screen disruptions of traditional mode changes (sudden unsynchronized refresh rate changes) that is visible on simpler CRTs. Those that always show sudden disruption (sudden picture shake/distortions during mode changes) are actually are more FreeSync friendly. 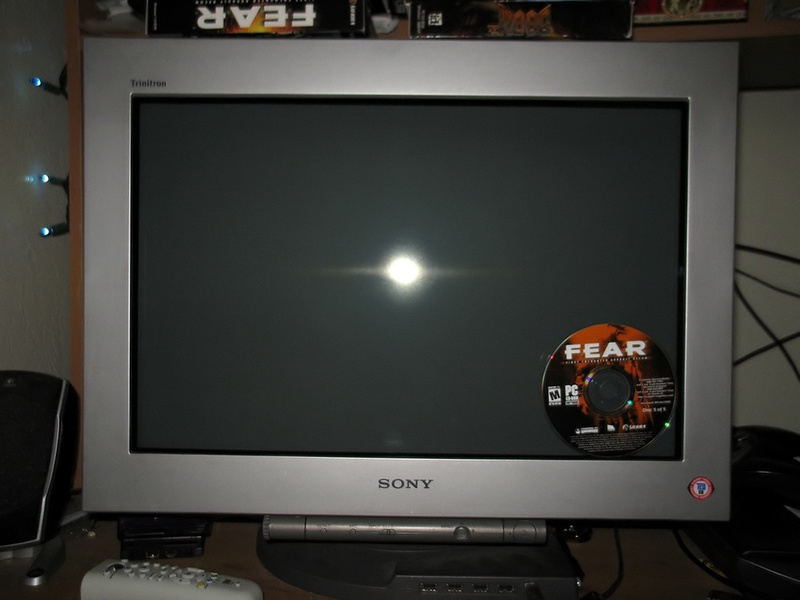 The synchronized refresh rate changes of FreeSync stay successfully visible on these CRTs, without being hidden by the blank-out circuitry (forced black screen during refresh rate change). That's why older full-range multisync CRTs tend to be unexpectedly more FreeSync-friendly than newer multisync CRTs. Ironically. It has a flat screen (W900 is curved). It has a smaller dot pitch. I believe it's a completely different tube. The electron gun optics are probably newer too. FreeSync / VESA Adaptive-Sync / HDMI 2.1 VRR -- simply varies the number of scanlines in the blanking interval. As a result, this is easily converted to analog format through 'dumb' adaptors such as unbuffered DVI-to-VGA adaptors. Metaphorically during variable refresh rate operation -- the height of that black bar simply varies -- The rows of pixels still come out at a fixed rate (often called "horizontal scan rate"), but the extra scanlines pads time between refresh cycles. That can vary now during VRR. This is why FreeSync works on certain 30-year-old multisync CRTs despite having never been tested before -- it's simply a variable-thickness black bar between refresh cycles. I'm researching HDMI-to-VGA adaptors, to do more testing of this, including this HDMI-to-VGA adaptor. Most likely, dumb adaptors that do an unbuffered 1:1 conversion from HDMI to VGA, are the best ones to use -- the ones that just convert dotclock verbatim to analog, will preserve the synchronization signals of FreeSync fully. Combine this with ToastyX to force VRR out of HDMI, and a supported Radeon card, this will permit VRR testing on CRTs for fun. Crossposted here from another forum, to answer people questions about mode-change blankout problems. They are sometimes interrupted into the middle of a refresh cycle, triggering a monitor into a mode change. Traditional resolution changes may also blank the signal (like a tiny, brief sleep). There is no guarantee how the mode change is seamlessly spliced into the cable bitstream. The new VBI must be perfectly seamlessly spliced between refresh cycles. Only FreeSync can guarantee perfectly synchronized equivalent of a "subtle mode change" at the cable signal level. Also, adaptors must not interfere with mode changes (unwanted scan conversions or timings modifications). 2. There are different ways to vary the height of VBI. The VBI black bar is a grand total (Front Porch + Sync + Back Porch) in number of scan lines. In an analog signal, porches are slightly below NTSC black while Sync is often much below NTSC black (far below the reference voltage of active-picture black). Porches act as temporal padding between active image and the sync signal, for synchronization electronics. FreeSync only changes one number of the three, and leaves the other two number untouched. This can bypass blankout electronics. 3. Arbitrary electronic blankout trigger thresholds may be too strict. It is possible that monitor safeguards electronically even on this. Monitor blank-out is an unwanted side effect that affects newer MultiSync monitors. FreeSync may be easier on the older GDM-W900 than the newer FW900, since you do not want the monitor electronics to be fussy and "play bad cop" doing unnecessary blankouts on perfectly-synchronized VBI-size-change. Otherwise, monitor blank-out electronics (whether linear-electronics-driven blankout or a firmware triggered blankout) makes FreeSync impossible on a specific true MultiSync CRT.